You are at:Home»Charging»My iPhone Won’t Charge! Here’s The Real Fix. When an iPhone won’t charge, it’s a big deal. I’m a former Apple employee, and during my time in the Apple Store, fixing iPhone charging problems was a big part of my daily work. The good news is that the majority of iPhone charging problems can be fixed at home. In this article, I’ll show you how to fix an iPhone that won’t charge, step-by-step. In spite of what you’ll read on many websites, the answer to this question is no! There’s a lot of misinformation out there, and that was one of the main reasons I wanted to write this article. As a former Apple tech with experience working with hundreds of iPhones that wouldn’t charge, I can tell you that replacing a battery is the absolute wrong thing to do. The truth is that most of the time, it’s your iPhone’s software — not hardware — that’s preventing your iPhone from charging. If your iPhone won’t charge, 99% of the time, replacing the battery will have zero effect! And, if there is a hardware problem, it’s much more likely that the issue is with the charging port itself — but we’re not there yet. iPhone 6S, 6S Plus, SE, and older models Press and hold the power button and the Home button together until the Apple logo appears on the screen, and then let go. iPhone 7 and 7 Plus Press and hold the power button and the volume down button together until the Apple logo appears on the screen, and then let go. iPhone 8, 8 Plus, X, XS, XS Max, and XR There are three steps: 1. Quickly press and release the volume up button. 2. Quickly press and release the volume down button. 3. Press and hold the power button (called the “side button” on iPhone X) until the Apple logo appears on the display, and then let go. 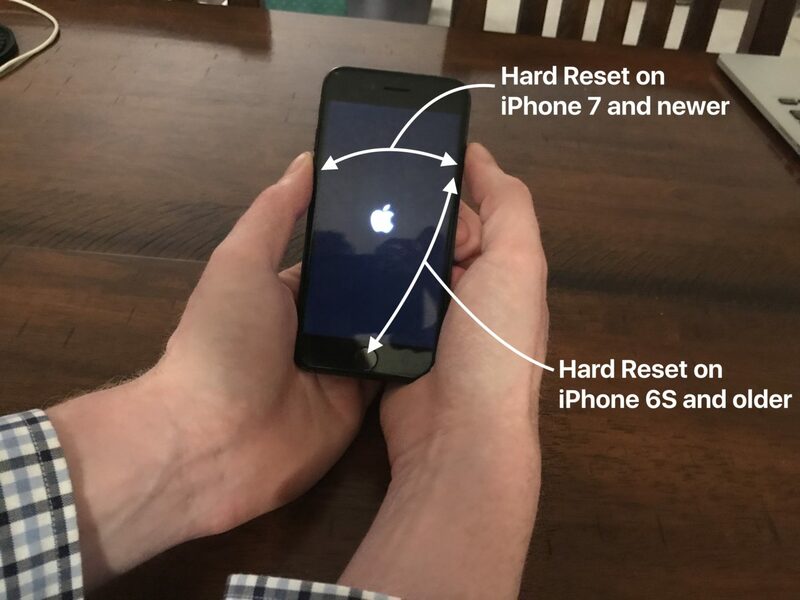 Apple tech tip: The #1 mistake people make while trying to hard reset their iPhone is that they don’t hold the buttons down for long enough. On iPhone 8 and X, however, make sure you are pressing the first two buttons very quickly and holding the power button down for a long time. Sometimes the process can take 20 seconds or more! If that doesn’t work, don’t worry! We’ll dive into the hardware fixes in the next step. Take a very close look at both ends of the USB cable you use to charge your iPhone. 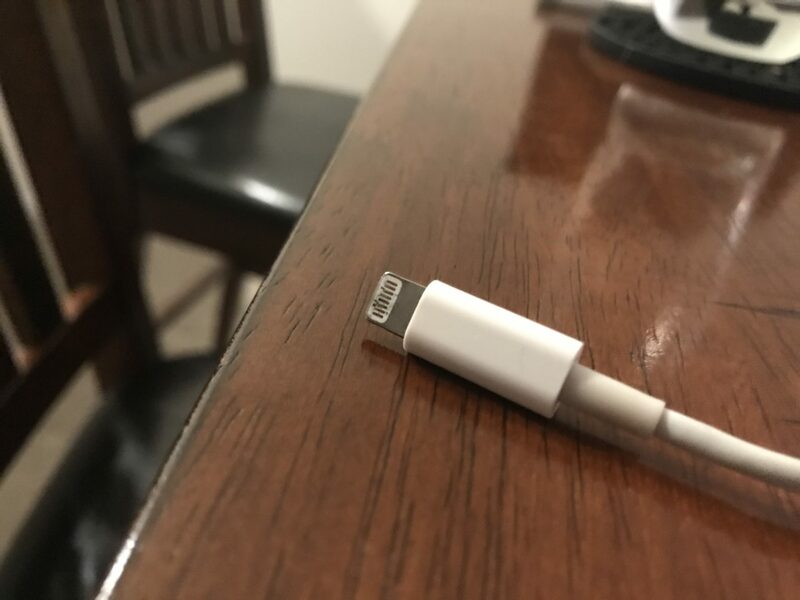 Apple’s lightning cables are prone to fraying, especially at the end that connects to your iPhone. If you see visible signs of wear, it might be time for a new cable. How can I tell whether my lightning cable is the reason why my iPhone won’t charge? If there is no visible damage to the outside of the cable, try plugging your iPhone into a USB port on your computer to charge instead of using the wall adapter that came with your iPhone. 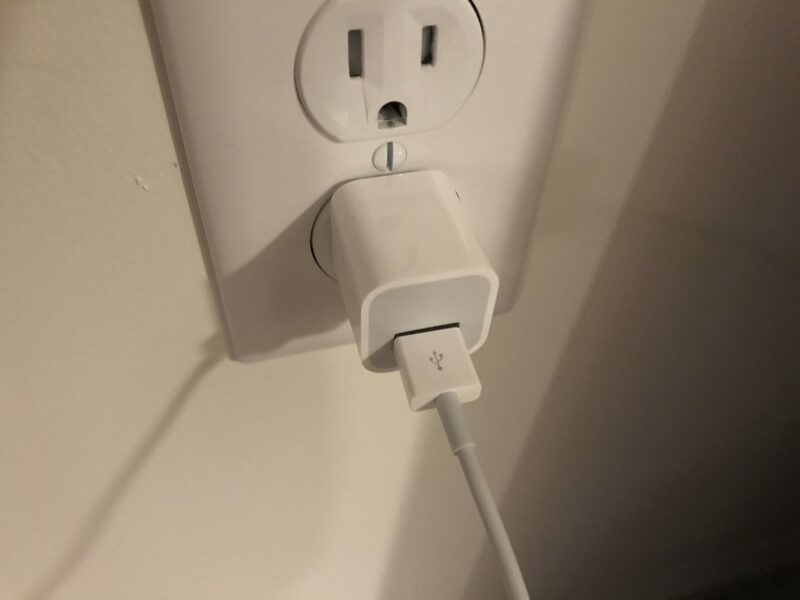 If you already charge your iPhone using your computer, try using the wall adapter. If it works in one place and not the other, your cable isn’t the issue. This might seem obvious, but sometimes the best way to determine whether you have a “bad cable” is to try charging your iPhone using a friend’s cable. If your iPhone suddenly springs back to life after you plug it in, you’ve identified the reason why your iPhone won’t charge — a faulty cable. Don’t forget about your iPhone’s warranty! If your iPhone is still under warranty, the USB cable (and everything else in the iPhone box) is covered! Apple will replace your lightning cable for free, as long as it’s in decent shape. You can set up a return on Apple’s support website or call your local Apple Store to make an appointment with the Genius Bar. If you decide to go to the Apple Store, it’s always a good idea to have an appointment at the Genius Bar before you go in. That way, you won’t have to wait in line — at least not for long. One of the most common reasons why an iPhone won’t charge comes from low-quality 3rd-party iPhone charger cables that people buy in gas stations. Yes, Apple cables are expensive, but in my experience, those $5 knockoffs never hold up like the real thing. There are good ones out there — you just have to know which ones to choose. High quality, less-expensive cables do exist! If you’re looking for a high-quality replacement iPhone charging cable that’s more durable than Apple’s, check out our favorites on Amazon. These aren’t cheap gas station cables that are going to break in a week. I love the 6-foot Lightning cable because it’s long enough for me to be able to use my iPhone in bed. Do you charge your iPhone by plugging it into the wall, using a car charger, in a speaker dock, in your laptop, or some other way? There are a lot of different ways to charge an iPhone. Remember that it’s your iPhone software that says ‘Yes’ or ‘No’ to charging when your iPhone connects to an accessory. 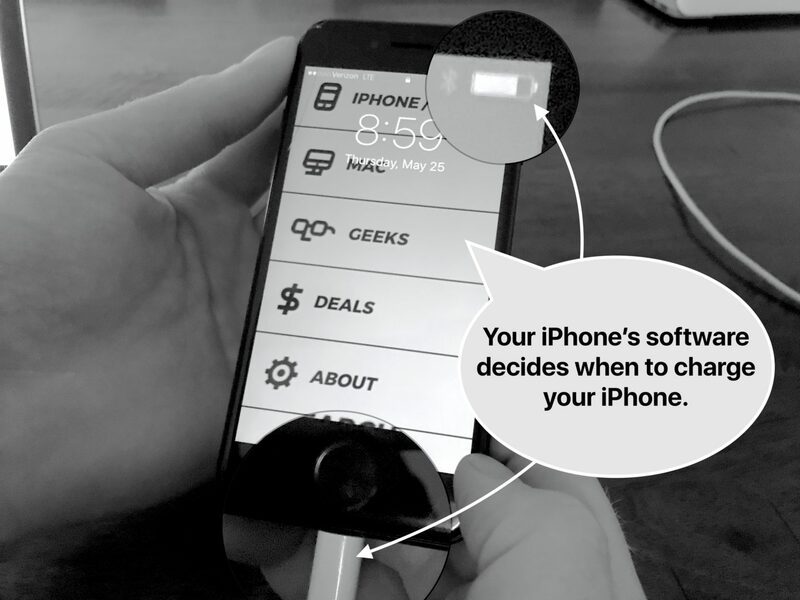 If the software detects power fluctuations, it will prevent your iPhone from charging as a protective measure. How can I tell whether my charger is the reason why my iPhone won’t charge? We’ll do the same thing we did when we inspected your Lightning cable. The simplest way to find out whether your charger is bad is to try another one. Make sure you try more than one because chargers can be very finicky. If your iPhone won’t charge with the wall adapter, try plugging it into a USB port on your computer. If it won’t charge in the computer, try plugging it into the wall — or try a different USB port on the computer. 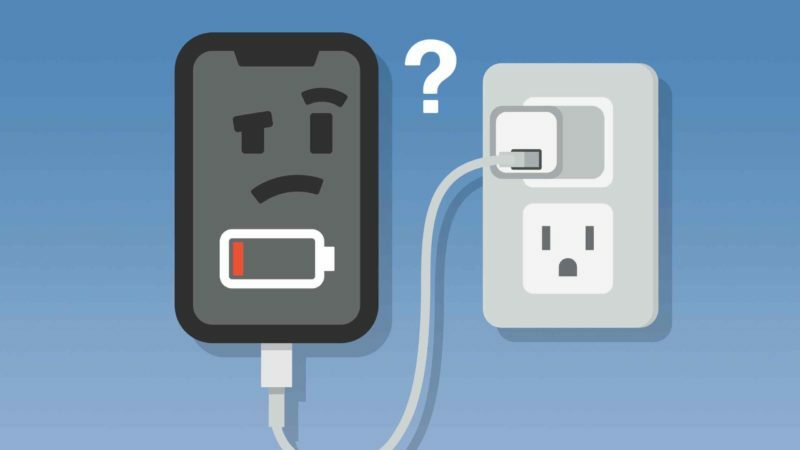 If your iPhone charges with one adapter and not the other, then your charger is the problem. If you need a new charger, check out the chargers we recommend using the same link as above (for the cable). The maximum Apple-approved amperage for iPhone chargers is 2.1 amps. Unlike many third-party chargers that can damage your iPhone, these ones will charge your iPhone quickly and safely. Hint: If you’re trying to charge using an Apple keyboard or USB hub, try plugging your iPhone directly into one of your computer’s USB ports. All the devices plugged into USB hubs (and keyboards) share a limited supply of power. I have personally seen iPhone charging problems occur because there wasn’t enough power to go around. Use a flashlight and take a close look at the charging port in the bottom of your iPhone. If you see any debris or gunk in there, it might be preventing the lightning cable from making a solid connection to your iPhone. There are lots of connectors down there (the lightning cable has 9), and if the wrong one is blocked off, your iPhone won’t charge at all. Grab a toothbrush (one you’ve never used before) and gently brush out your iPhone’s charging port. 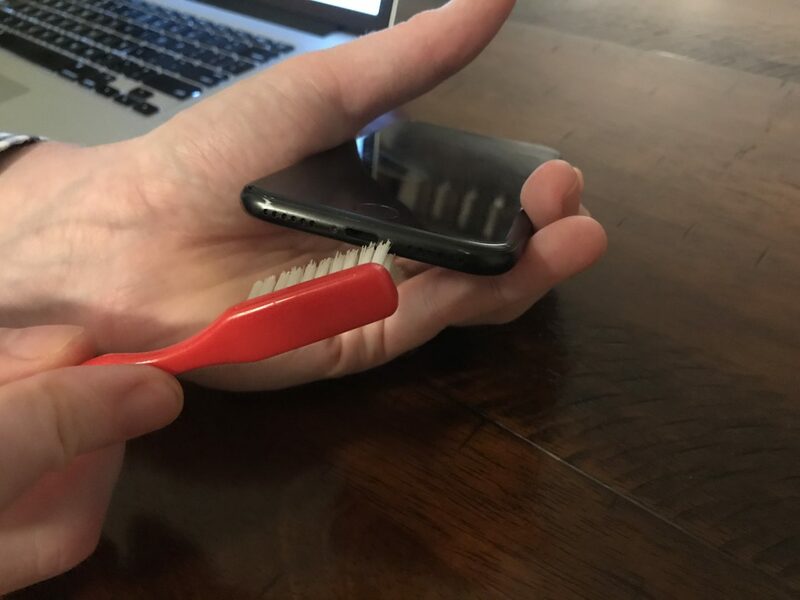 When I was at Apple, we used fancy anti-static brushes to do this (which you can get on Amazon for next to nothing), but toothbrushes work just as well. One of the most common reasons why an iPhone won’t charge is liquid damage. Liquid damage can short out the connections in the charging port of your iPhone cause all sorts of problems with your iPhone. Even if you’ve dried out the port and brushed out the gunk, sometimes the damage has already been done. Even if your iPhone won’t charge, a DFU restore may still work! You’ve eliminated the possibility of a simple software problem and taken a look at your USB cable, charger, and the iPhone itself, so it’s time for a last-ditch effort — the DFU restore. A DFU restore is a special kind of restore (when you restore your iPhone, you erase everything on it and restore it to factory settings) that can solve severe software issues — if they exist. 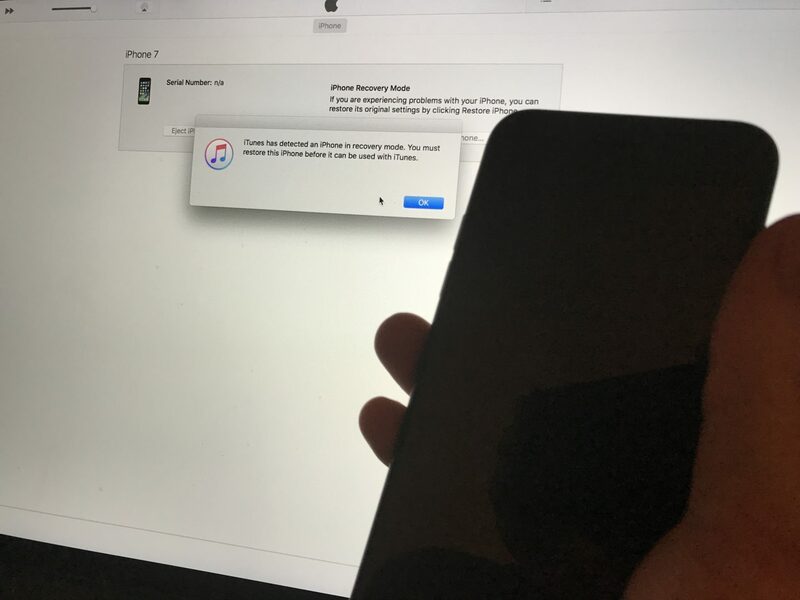 Check out my article about how to DFU restore an iPhone to learn how to put your iPhone into DFU mode, and cross your fingers before you try. When I worked for Apple, this is the first thing I’d try, even when the phone appeared to be damaged. There’s a small chance that a DFU restore will bring a non-functional iPhone back to life. If it doesn’t work, come back here to learn about some great repair options you may not be aware of. If you need to fix your iPhone today, Puls is a great, affordable, in-person repair service. They’ll meet you at home or a location of your choice in as little as 60 minutes. Puls offers a lifetime warranty on parts and labor, and you only pay after they complete the repair. They also offer the option to repair your iPhone’s charging port and other smaller components that Apple won’t touch. There’s a chance you’ll be able to recover your data and save money too! Full transparency: We receive a referral fee if you choose to repair your iPhone with Puls. That said, I truly believe they are best and easiest option for many people. I hope your iPhone has sprung back to life and you’re on your way back to a full charge. I’d love to hear from you about your experiences fixing the iPhone charging problem, and I’m here to help along the way. Previous ArticleWhy Does My iPad Ring? Here’s The Fix For iPad And Mac! Next Article My iPhone Is Stuck In Headphones Mode. Here’s The Real Fix!